A good-looking floor can enhance the value of the space of your home. You may not notice it, but it is something you should consider before installing. Tile flooring comes in a variety of materials. The two most commonly used are natural stone and ceramic. The national average cost is $1.758. Tile flooring is very durable. The hard surface is impenetrable and works well in any room. To install tile flooring, first, you need to install a cement board underlayment, lay out your chosen tiles, start installing from the center, leave it overnight, mix the grout, and then clean the tile. Cleaning is fairly easy. Sweep or vacuum your tile floors a couple of times a week. Once the dirt is removed, you are ready to mop. Stone comes from the earth, making each piece of stone one of a kind. Every floor is unique. There are a few well-known natural stone floorings: slate, marble, granite, and sandstone, each has slightly different properties. Before grouting is placed, all-natural stones should be sealed, and the floor should be kept clean. Maintain the floor from foot traffic, so it doesn’t combine with grit and debris to wear the floor down prematurely. Take care of your stone flooring by always using approved cleaners when cleaning. The national average cost to install stone flooring is $1.805. The natural, timeless beauty and lasting durability are what makes hardwood flooring being sought after. However, hardwood can get weary over time, but generally, this flooring type offers the long-lasting, and eternal beauty looks that floor enthusiast value. It costs $4.399 to install on average. To maintain it, use a damp mop, not wet. Mop the floor with the cleaner. Rinse the floor with water to remove the remaining cleaner. Lastly, run with a dry towel to make sure it’s clean. This flooring type is a tough one; it is built to handle all the things that are usually the enemy of flooring: high traffic, spills, messes, and dirt. Even the grout is stain resistant. Engineered wood flooring cost $4.32 per square foot, on average; prefinished solid wood averages cost $5.85 per square foot. However, an engineered wood floor will last you from 2 to 10 years depending on the thickness of the top veneer. Cleaning an engineered wood flooring is a commitment, you need to make sure that it is daily swept, mopped, and kept dry. Once the concrete or resin sets, you now have a durable floor that resembles a beautiful mosaic. To clean it, wet the floor and leave it on for a few minutes, let it dry and sweep it clean. Make sure nothing is stuck in between. Marbles are all-purpose. They can be used for floors and walls. Marble flooring is one of the most durable and resourceful option to use. They are easily cleaned and maintained. Marble floorings are also very easy to carve with stylish designs that go in line with your taste. To clean, use a natural, light soap or marble cleaner only. On average, most homeowners pay $10 to $20 per square foot. A professionally installed marble floor cost around $9-$20 per square foot, and more specialized jobs can cost $50 per square foot or more. PVC flooring or polyvinyl chloride is made into a variety of flooring products. They include many products with fabricated wood grain to mimic hardwood flooring. However, it is low in durability compared to other plastic. The total average cost of PVC flooring is $3.58 – $5.35 per square foot. And the installation cost ranges between $105.00 – $175.00. To clean your polyvinyl chloride floor, use the mildest possible method. Sweep or vacuum it every evening and wipe up spills right away. Choosing the right flooring where acid resistant tiles are required are essential. Some of the industries include food and beverages, pharmaceuticals, manufacturing plants and other environments. Acid resisting flooring is guaranteed to give the lasting protection. They are durable to acid, and they shall be of a ceramic material with a thickness not less than 20 mm x 200 mm. 4.5. Cementing materials for bedding, jointing, and pointing. For regular cleaning, simply dust mop. For deeper cleaning, wash down the entire floor and use a squeegee to absorb the residue. Linoleum flooring is long-lasting, easy to clean, and often contains recycled content. Real linoleum is made all-natural: it consists of cork dust, linseed oil, tree resins, wood flour, pigments and ground limestone, they are all pressed into one. Linoleum flooring is very DIY-able. Mostly sold in individual tiles or sheets, which quickly click together when installed on the flat ground. It costs $4.40 – $6.50 per square foot. To clean, simply vacuum or sweep the floor to remove any dirt particles and mop. Rubber flooring can be made of two types of rubber. Natural tree rubber or from synthetic materials like old vehicle tires. These materials have extreme durability and are low-maintenance. To clean, damp mop the floor with your choice of solution, let it sit for 5-10 minutes, and finish by damp mopping the flooring at the end with clean water to rinse the soap residue. Magnesite flooring is a form of cement that is created through magnesium oxychloride. There are many benefits of having it. Magnesite floorings are much more durable compared to cement. It is also resistant to oils and grease, lightweight, and event noncombustible. The material helps keep houses cool in hot months. Generally, clean and treat the magnesite flooring as you would with a wooden surface. Clean it with nonoil products. On average, vinyl flooring costs $3.41 per square foot, nearly $1.50 cheaper per square foot than porcelain flooring. The tiles are durable, affordable, and low-maintenance. They hold up against foot traffic, kids, and dropped objects under normal household. These materials are one of the simplest types of flooring to install yourself. Vinyl flooring is a great type of flooring for you to do because of its easy peel-and-stick installation. And to clean it, use the mildest method, sweep or vacuum it only. If something spills, wipe it right away. Mosaic flooring is often used as a decorative piece in interior design. They are mostly made of small, flat, roughly square pieces of stone or glass. On average, the cost per square foot is ranging between $6.53 – $9.07. The durability of mosaic flooring is very durable, and they are resistant to cracking. However, the installation cost is ranging between $125.00 – $190.00 if you want the professional one. Cleaning wise, you can mix baking soda and water, and then scrub the area with a stiff sponge. Once it’s stain free, clean normally. 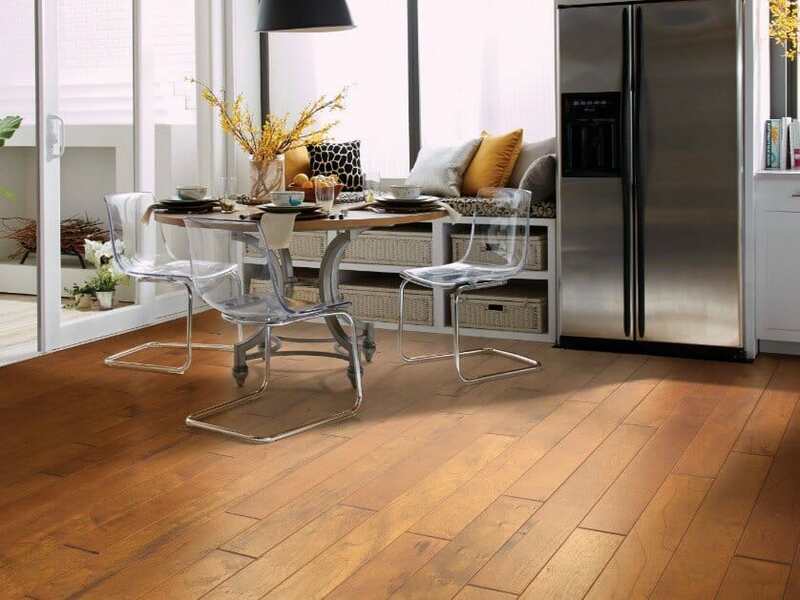 Bamboo flooring looks elegant, and it comes in a variety of color choices, ranging from honey brown to light tan. Bamboo flooring is durable and elegant. It provides a clean and robust surface, but it could darken over time, especially when exposed to sunlight. On average, bamboo floor costs $5 – $7 per square foot. Including installation, it can cost up to $10 per square foot. To clean bamboo flooring, you need to do it weekly. Use a small amount of water in a damp mop and clean with a hardwood floor cleaning solution. Parquet flooring is also a decorative piece of flooring; it is a geometric mosaic of wood pieces. It can deliver a beautiful and durable alternative to the conventional hardwood flooring. As for cleaning, use a mop, water, and cleaner that are designed for parquet flooring. Use as little water and cleaner as possible. You can prevent water damage, scratches, and other damages by not scrubbing too hard. It costs $5.58 per square foot on average, and the installation cost is $36 an hour on average. Glass flooring is strong, durable, and resistant to dynamic loads. Given that, it is also a beautiful piece to put in a home, because it is transparent. It is often what makes the home pop out; it makes the home look beautiful and attractive. It is also easy to clean and to take care of. Mix water and white vinegar evenly. Spray it on your glass flooring and let it sit for 10 minutes. Scrub the glass flooring gently, making sure not to scratch the surface of the glass. Afterward, use water to rinse the floor and wipe it dry. Glass flooring costs $150 – $250 per square foot on average. Laminate flooring is one of the cheapest flooring types you could choose. It is also easy to maintain. It has a strong and durable surface. Laminate flooring is resistant to burns, scratches, and chips. To clean laminate flooring, avoid using cleaning solutions directly to the surface of the laminate, it will cause staining. Dry up any water spills immediately. It costs $5 per square foot. It’s also easy to install by yourself. However, the average installation costs $2 – $8 per square foot. Selecting the carpet can cost as little as $2 per square foot. And as for durability wise, it is determined by three factors: the fibers, the twist, and the density. The most durable fibers are the ones that are wear-resistant and protect against dirt and stains. The types of carpet fiber include nylon, wool, polyester, cotton, acrylic, and olefin. To clean it, vacuum the carpet. Take a damp cloth with cleaner and lay the cloth on the carpet for an hour, blot the damp area with a dry cloth. Brick flooring has the durability combination of tile or stone with the warm colors of wood. It can work with most home styles. To install brick flooring, you need to level and clean the subfloor, locate the center point of the room, mix the thin-set mortar, apply the mortar, lay the first brick, cut it into size, apply the sealer, apply the grout and do the finishing. To clean it, use one tablespoon of warm water and scrub with brush mop. Brick flooring costs from about $5 to $10 per square foot. The surface of a concrete floor is very hard. The strength and durability are very reliable. However, it can be a liability to keep clean. Chances are if you trip and fall, you are going to hurt yourself. To clean concrete flooring, apply a wet mop to the floor and rinse it with a damp mop of water. You can choose to apply a concrete sealant to prevent future stains on your concrete floor. Concrete floors are fairly cheap; it costs $2 – $6 per square foot. For finishing, it costs around $5 – $8 per square foot. Mud flooring is not carefully crafted. It gives special attention to the final surface. It is then impregnated with a blend of oils and waxes for durability, resistance to abrasion, yielding a smooth and luxurious surface. It is safe to say that mud flooring is durable. To clean mud flooring, remove dust and dirt with a broom and dustpan. When additional cleaning is needed, use plain oil soap, apply with a mop. Removing buildup dirt is as easy is using plain water. Make sure there is no residue. Mud flooring installation costs $3 per square foot. Cork flooring is expensive. But sometimes it can be as cheap as $1.10 per square foot, and sometimes it can be as high as $6.25 per square foot. It depends on the material and the characteristics of your chosen cork flooring. However, cork flooring has a very long life and is repairable if damaged. To install it, you can’t do it directly with plank flooring, vinyl, or linoleum. You need to screw a plywood underlayment at least ¼ in. Cleaning wise is fairly easy, you need to wipe away spills immediately. Sweep and vacuum it regularly. Those are the 22 types of flooring you should and could consider for your home based on its durability, cost, installation, and cleaning. It sure was nice to know that the most durable kind of carpet flooring is the fibers that are wear-resistant and do not stain very easily. I wonder if there is somebody that I can ask to guide me through it since I am interested in carpet flooring. Anyway, I will also do my research since we won’t be replacing the flooring until next month. Thank you. It was really nice that you talked about the hardwood flooring and how it gives timeless beauty as well as durability that makes it appealing and long lasting at the same time. Surely my parents will love this flooring since this has all the quality that they are looking for. Though, I do think that they should decide because they are the ones who will be paying the flooring contractor. I’ll just share it. Thanks!